Chocolate and Mint are meant for each other. This classic flavor combination is one of my favorites. Cool, refreshing mint with creamy chocolate. 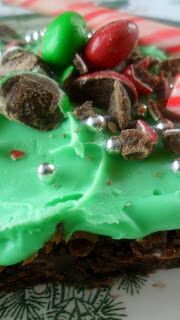 Chocolate Mint Brownies with Peppermint Frosting are perfect for the holidays. 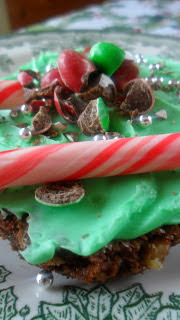 Decorate the top of the brownies with candy canes, whole or crushed, sprinkles and mint m & m’s. The recipe that follows is for homemade brownies. They’re made with cocoa, the usual brownie ingredients and mini chocolate chips, chopped mint m &m’s and pecans. If you are crunched for time during this busy season, you can certainly substitute your favorite boxed brownie mix. 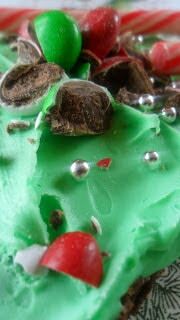 You can substitute mint chocolate chips (winter blend I think theyre called) for the coarsely chopped mint m & m candies. We used a ready-made peppermint frosting by Pillsbury, that we tinted green. If you can’t find peppermint frosting in your area, simply stir 1/2 to 1 teaspoon peppermint extract into a container of white/vanilla or cream cheese frosting. Use green gel food coloring to tint the frosting. Grease a 13 x 9 x 2 baking dish. Stir together cocoa and baking soda in large bowl; Stir in 1/3 cup melted butter. Add water; Stir until mixture thickens. Stir in sugar, eggs, and remaining 1/3 cup melted butter. Stir until smooth. Add flour, extract and salt; stir until well blended. Stir in chips, m & m’s, pecans and chocolate topping. Spread into prepared pan. Bake at 350º for 35- to 45 minutes or until toothpick inserted in middle comes out clean. Do not over bake. Cool pan on wire rack. Savory Cheese and Leek Scones Can be eaten alone or bowls of soup, stew or chili. I really love the colors in these brownies.. so wonderfully feastive. thanks for coming by foodie friday. Cute Blog! Love the colors in this sweet treat of a post, too! Those look delish!! I would love for you to share at the Friday hop! !